President of Thai-Nichi Institute of Technology (TNI),Thailand. Chairman of Council of IT Deans of Thailand (CITT). Krisana Chinnasarn, Burapha University (BUU), Thailand. Phayung Meesad, King Mongkut's University of Technology North Bangkok (KMUTNB), Thailand. Anong Rungsuk, Nakhon Phanom University (NPU), Thailand. Chetneti Srisaan, Rangsit University (RSU), Thailand. Dechanuchit Katanyutaveetip, Siam University (SiamU), Thailand. Kriengkrai Porkaew, King Mongkut's University of Technology Thonburi (KMUTT), Thailand. Narongdech Keeratipranon, Dhurakij Pundit University (DPU), Thailand. Nopporn Chotikakumtorn, King Mongkut's Institute of Technology Ladkrabang (KMITL), Thailand. Pattanasak Mongkolwat, Mahidol University (MU), Thailand. Pisit Charnkeitkong, Panyapiwat Institute of Managment (PIM), Thailand. Poonpong Boonbrahm, Walailak University (WU), Thailand. Sasitorn Keawmun, Mahanakorn University of Technology (MSU), Thailand. Sinchai Kamolphiwong, Prince of Songkla University (PSU), Thailand. Somsak Chartnamphet, Silpakorn University (SU), Thailand. Teeravisit Laohapensaeng, Mae Fah Luang University (MFU), Thailand. Thana Sukvaree, Sripatum University (SPU), Thailand. Thirapon Wongsaardsakul, Bangkok University (BU), Thailand. Thitirath Cheosuwan, University of Phayao (UP), Thailand. Woraphon Lilakiataskun, Mahanakorn University of Technology (MUT), Thailand. Norio Shiratori, Chuo University (CHUO-U) / Tohoku University (TOHOKU), Japan. Kenzo Takahashi, University of Electro-Communications (UEC), Japan. Susumu Yoshida, Kyoto University (KYOTO-U), Japan. Yoshikazu Miyanaga, Hokkaido University (HOKUDAI), Japan. Branka Vucetic, University of Sydney (SYDNEY), Australia. Ying-Dar Lin, National Chiao Tung University (NCTU), Taiwan. Yasushi Kato, Sendai Foundation for Applied Information Sciences (SFAIS), Japan. Kosin Chamnongthai, King Mongkut's University of Technology Thonburi (KMUTT), Thailand. Waree Kongprawechnon, Sirindhorn International Institute of Technology (SIIT), Thailand. Virach Sornlertlamvanich, Sirindhorn International Institute of Technology (SIIT), Thailand. Kuntpong Woraratpanya, King Mongkut's Institute of Technology Ladkrabang (KMITL), Thailand. Chotipat Pornavalai, King Mongkut's Institute of Technology Ladkrabang (KMITL), Thailand. Noppadol Maneerat, King Mongkut's Institute of Technology Ladkrabang (KMITL), Thailand. Sakchai Tipchaksurat, King Mongkut's Institute of Technology Ladkrabang (KMITL), Thailand. Saiyan Saiyod, Khon Kaen University (KKU), Thailand. Wimol San-Um, Thai-Nichi Institute of Technology (TNI), Thailand. Putchong Uthayopas, Kasetsart University (KU), Thailand. Chaodit Aswakul, Chulalongkorn University (CU), Thailand. Kazuhiko Hamamoto, Tokai University (TOKAI-U), Japan. Samuel S. Chua, Lyceum of the Philippines University (LPU), Philippines. I Wayan Mustika , Universitas Gadjah Mada (UGM), Indonesia. Hitoshi Isahara, Toyohashi University of Technology (TUT), Japan. Kaoru Takahashi, National Institute of Technology, Ariake College (ARIAKE-NCT), Japan. Salahuddin Muhammad Salim Zabir, National Institute of Technology, Tsuruoka College (TSURUOKA-NCT), Japan. Takashi Mitsuishi, Tohoku University (TOHOKU), Japan. Hiroshi Tsunoda, Tohoku Institute of Technology (TOHTECH), Japan. Annop Monsakul, Thai-Nichi Institute of Technology (TNI), Thailand. Datchakorn Tancharoen, Panyapiwat Institute of Managment (PIM), Thailand. Narongrit Waraporn, King Mongkut's University of Technology Thonburi (KMUTT), Thailand. Nutchanat Buasri, Mahanakorn University of Technology (MSU), Thailand. Pakapan Limtrairut, Bangkok University (BU), Thailand. Panwit Tuwanuti, King Mongkut's Institute of Technology Ladkrabang (KMITL), Thailand. Pawitra Chiravirakul, Mahidol University (MU), Thailand. Prajaks Jitngernmadan, Burapha University (BUU), Thailand. Pruegsa Duangphasuk, Mahanakorn University of Technology (MUT), Thailand. Pornthep Rojanavasu, University of Phayao (UP), Thailand. Rattana Wetprasit, Prince of Songkla University (PSU), Thailand. Rawiworn Hongma, Nakhon Phanom University (NPU), Thailand. Suppat Rungraungsilp, Walailak University (WU), Thailand. Watchareewan Jitsakul, King Mongkut's University of Technology North Bangkok (KMUTNB), Thailand. Adisak Suasaming, Thai-Nichi Institute of Technology (TNI), Thailand. Budsaraphorn Luangmalawat, Thai-Nichi Institute of Technology (TNI), Thailand. Cholrit Luangjinda, Thai-Nichi Institute of Technology (TNI), Thailand. Ferdin Joe John Joseph, Thai-Nichi Institute of Technology (TNI), Thailand. Kasem Thiptarajan, Thai-Nichi Institute of Technology (TNI), Thailand. Kanakarn Ruxpaitoon, Thai-Nichi Institute of Technology (TNI), Thailand. Narungsun Wilaisakoolyoug, Thai-Nichi Institute of Technology (TNI), Thailand. Nattagit Jiteurtragool, Thai-Nichi Institute of Technology (TNI), Thailand. Paskorn Apirukvorapinit, Thai-Nichi Institute of Technology (TNI), Thailand. Prajak Chertchom, Thai-Nichi Institute of Technology (TNI), Thailand. Pramuk Boonsieng, Thai-Nichi Institute of Technology (TNI), Thailand. Saprangsit Mruetusatorn, Thai-Nichi Institute of Technology (TNI), Thailand. Sared Wansopa, Thai-Nichi Institute of Technology (TNI), Thailand. Saromporn Charoenpit, Thai-Nichi Institute of Technology (TNI), Thailand. Sophon Mongkolluksamee, Thai-Nichi Institute of Technology (TNI), Thailand. Pranisa Isarasena, Thai-Nichi Institute of Technology (TNI), Thailand. Triratana Metkarunchit, Thai-Nichi Institute of Technology (TNI), Thailand. Theantot Prapuetchob, Thai-Nichi Institute of Technology (TNI), Thailand. Thitiporn Lertrusdachakul, Thai-Nichi Institute of Technology (TNI), Thailand. 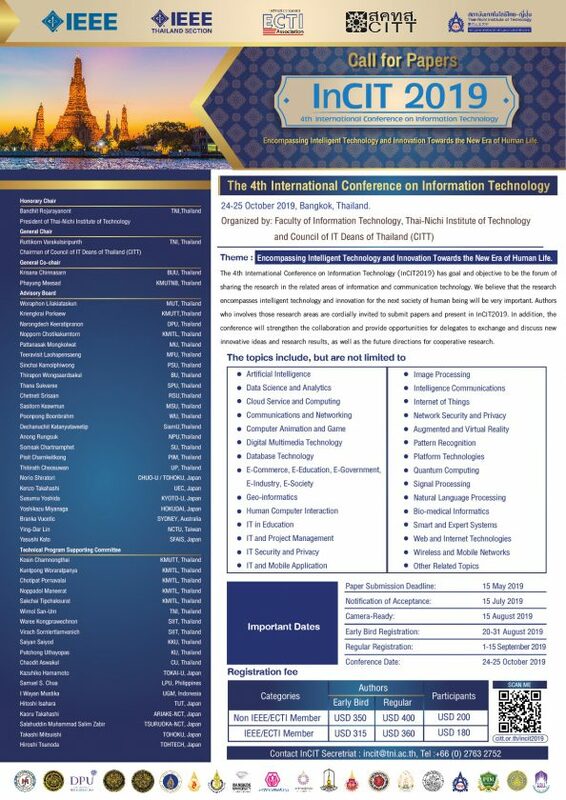 The 4th International Conference on Information Technology (InCIT2019) has goal and objective to be the forum of sharing the research in the related areas of information and communication technology. We believe that the research encompasses intelligent technology and innovation for the next society of human being will be very important. Authors who involves those research areas are cordially invited to submit papers and present in InCIT2019. In addition, the conference will strengthen the collaboration and provide opportunities for delegates to exchange and discuss new innovative ideas and research results, as well as the future directions for cooperative research. InCIT is the International Conference regularly organized by The Council of IT Deans of Thailand (www.citt.or.th) in every year from 2016. InCIT2017 and InCIT2018 were officially approved by IEEE for technical support and co-sponsor. All the presented papers have already uploaded to IEEE Xplore Digital Library. Continuously, the InCIT2019 has already received the official recommendation from the IEEE Thailand Section for endorsement of the IEEE technical support and co-sponsor. The MOU/LOA with IEEE for InCIT2019 will be achieved. The venue of InCIT2019 will be at the conference center in Building E of Thai-Nichi Institute of Technology (www.tni.ac.th). The location is closed to Bangkok International Airport and the central of Bangkok. Furthermore, the Building E is the newest and just opened for operation from January 2019. The conference center is very modern and fully equipped with excellent infrastructure. Please come and attend InCIT2019, and enjoy your short visit to Bangkok and Thailand as well.